Set of 6 Premium Pistons. Engine Rebuild Kit for M54 2.5 Engine. Kit Includes, pistons, rings, bearings, head bolts, full gasket set and extra parts to rebuild your VANOS. Please let us know sizes of pistons and bearings. Made by: SPD / Victor Reinz. 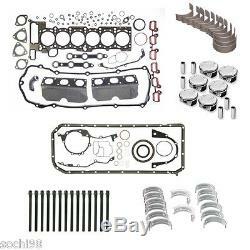 Brand new OEM quality one (1) Engine Rebuild Kit to fit BMW M54 engine cars. When ordering please make sure you include Year, Make, Model and VIN number of your car. This will give us an opportunity to verify that this part will fit your vehicle. Special orders, Manuals and Electrical items are not refundable. We started out as a small group of BMW enthusiasts who got together to work on various BMW cars. We sell quality parts that we also install on our cars. Thank you for checking out our auctions. Add a map to your own listings. The item "BMW E39 E46 325i 525i X3 M54 2.5 Engine Rebuild Kit 02-06 Gasket Pistons Rings" is in sale since Monday, November 23, 2015. This item is in the category "eBay Motors\Parts & Accessories\Car & Truck Parts\Engines & Components\Pistons, Rings, Rods & Parts". The seller is "sochi98" and is located in Seattle, Washington. This item can be shipped worldwide.